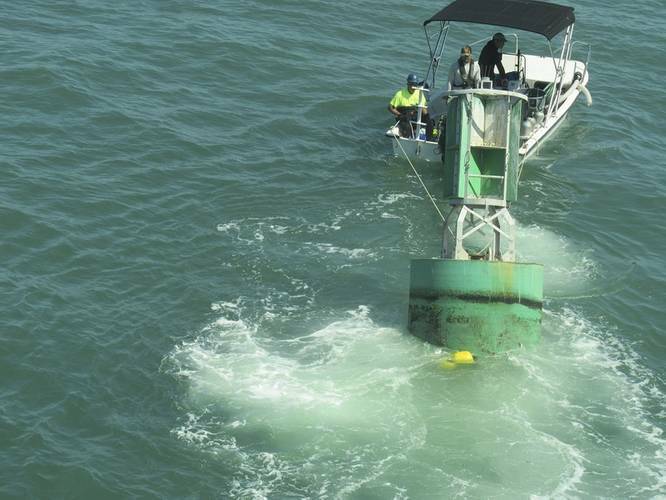 The U.S. Coast Guard uses navigational buoys to direct water traffic and to protect vulnerable benthic ecosystems such as seagrass communities and coral reefs in U.S. waters. However, most buoys are currently attached to the seafloor by concrete anchors, also called sinkers, and heavy metal chains that can have a significant impact on marine life. Sinkers can damage life on the seafloor under their heavy footprint, and when the connecting chains are lax, they can scrape off seagrasses, seaweeds and corals around the sinkers as waves and wind push the buoys around. The Coast Guard has been struggling to find a solution for more than 20 years, and about two years ago, the service reached out to the Department of Homeland Security (DHS) Science and Technology Directorate (S&T) for help. Subsequently, S&T organized a prize competition in January 2016. Besides receiving proposals from across the country, S&T received several proposals from the international community, even though they weren’t eligible to receive a cash prize under the America COMPETES Act. From among the proposals, S&T found a potential solution to the problem in a simple, but effective, buoy mooring system. Instead of a concrete sinker, Cole Keaoulu Santos, an innovator from Hawaii, proposed a narrow screw anchor; instead of a heavy metal chain, he suggested an elastic rope to prevent scraping of the ocean floor. In April, the RDC embarked on a two-year experiment to test several different types of mooring systems, inspired by Santo’s concepts. The RDC, using U.S. Coast Guard cutter Joshua Appleby, a 175-foot Keeper Class coastal buoy tender, deployed five buoy mooring systems near the coast of St. Petersburg, Florida. There, the buoys’ impact on the ocean floor and ability to withstand the elements while staying securely moored will be evaluated. The results will determine if the moorings are fit to be adopted on a broader scale. “The Coast Guard, as marine environmental stewards, wanted the RDC to research minimally invasive methods for anchoring and mooring marker buoys in environmentally sensitive areas,” said James Fletcher, Chief of RDC’s Environment and Waterways Branch; one of the Branch’s missions is environmental protection. Coral reefs and seagrasses are among the most biologically diverse ocean ecosystems; they provide important habitat for marine life – manatees, sea turtles and a variety of fish and invertebrates. An environmentally sensitive mooring system can help preserve these ecosystems. The reason for testing different types of mooring systems is to find the most durable and efficient one. 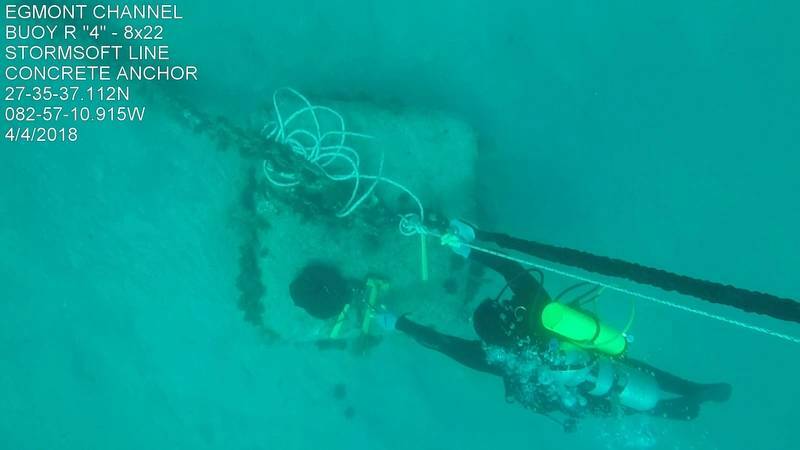 The Coast Guard decided to install two types of anchors at water depths of 38 to 48 feet—the traditional concrete sinker and the helix (screw). Three types of mooring lines are being used – StormSoft, Hazelett and Supflex. Using helical anchors and elastic mooring lines is not new. Recreational boaters have been using the concept, called eco-mooring, for some time. In early April, for two consecutive days, the cutter crew and dive team worked tirelessly to complete their mission. The first day they replaced the metal chains with one StormSoft and one Hazelett mooring line models, and on the next day – with two StormSoft and one Supflex. At first, the plan was to attach the mooring lines to two concrete sinkers and three helix anchors. However, due to technical difficulties, the divers were only able to screw one helix anchor to the seafloor. The rest of the lines were attached to concrete. The Coast Guard hopes to retrofit two of the sinkers with helix anchors during one of the future monitoring visits. For the next two years, the Coast Guard will visit the buoy moorings every three months to monitor their durability. The dive team will document the condition of each mooring line and will provide photographic and video evidence. 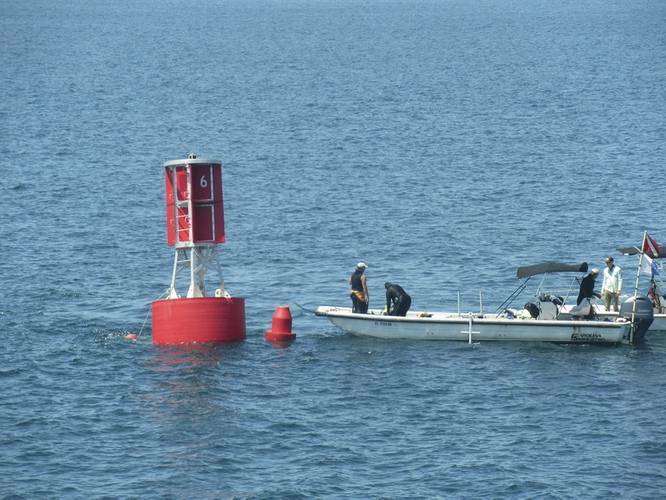 When the testing period is over, the Coast Guard will prepare a final report of the eco-friendly buoy moorings to support future decisions. “The Coast Guard is very conscious to protect the environment, so we are willing to do these experiments, even if there is a little bit of a risk involved to their success, to find a better way to protect the environment and minimize harmful impacts,” said Fletcher.